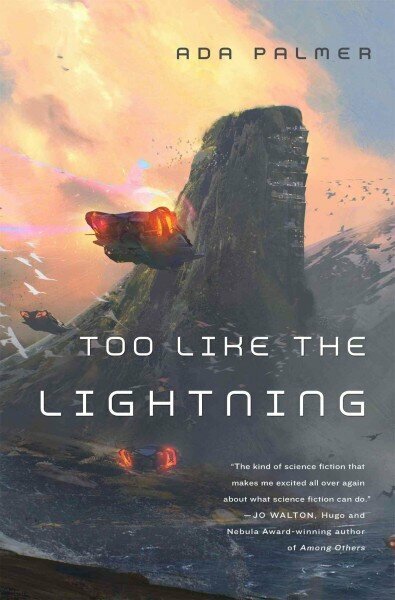 Too Like the Lightning is a strange book. At times, it is a difficult book. It is also a very, very good book. A work of science fiction, for sure (we’ve got flying cars, people) it’s also much more than that. It’s an attempt to transport enlightenment ideas about social organization, personal freedom, and democracy into a future of flying cars, hyper surveillance, and profound changes in to the ideas of gender, religion, and work. Oh yeah, and it’s written in a style that is part Voltaire, and part Isaac Asimov. Like I said, it’s weird. I loved it. The plot of a book like this is almost beside the point, but suffice it to say, there’s a mysterious break in at one of the world’s most important locations, a hidden child with supernatural powers, and a narrator who is much more than he seems at first. But really, who cares about the plot? I didn’t I cared about the careful construction of the political ideas of the various governments, the fascinating life stories of the novels main characters and the very thoughtful explorations of how the future would handle issues like gender (they is pervasive, yet people still assign genders internally) and religion (you can have it, but don’t talk about it). Palmer has clearly spent enormous amounts of time building the backstories of her characters and her world, much is left unsaid here, forcing the reader to piece it together. But you can tell that what is left out is intentional, a prompt for the reader to make the connections, it certainly isn’t because it hasn’t been thought through. It has, trust me, she’s just not showing all her cards (yet). This is a novel, yes, and fairly successful one from a plot perspective. But more interestingly, it’s an elaborate thought experiment using Palmer’s expertise in philosophy and the renaissance (she teaches history at Chicago) to imagine a future world that is both utopia and nightmare. The first in a planned series, I can’t wait for the rest.